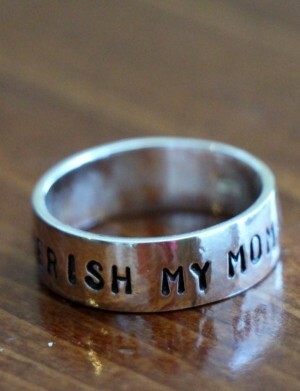 Sterling silver memorial ring personalized with a name, date of passing, inspirational phrase- perfect remembrance gift for men and women to honor a loved one. 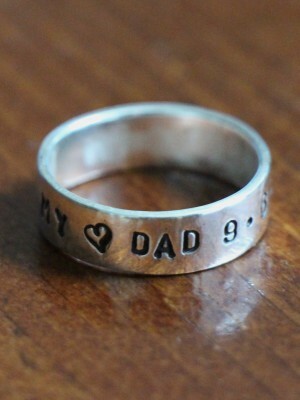 Categories: Collections, Hand Stamped Rings, Memorial Jewelry, Rings. Tags: memorial jewelry, mens jewelry, personalized ring, sterling silver, womens jewelry. “I carry your heart in my heart,” inspired by E.E. Cummings. “Cherish My Mom,” personalized with a name or date. “Mommy of An Angel,” personalized with a name or date. “Forever in my Heart,” personalized with a name or date.